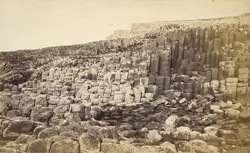 "The Giant's Causeway is the low rocky mole, composed of columnar basalt, separating Port Ganny from Port Noffer. Its outline is very irregular - the greatest length, 700 feet; the greatest breadth, 350 feet; the greatest height, thirty-three feet; and the area about three acres. In 1814 Sir Walter Scott visited the Causeway, in a nautical excursion made chiefly round the Scottish coast. He describes the shores as 'extremely striking as well as curious.'"